I love me some spicy food. Whether it’s an elaborate Thai meal from legendary Los Angeles institution Jitlada or an afternoon of jalapeño cocktails and bites, I’m into it — no matter how many napkins and tissues I may destroy in the process. Naturally, a game about spiciness — or, more specifically, chiles — would certainly pique my curiosity. For the uninitiated, spiciness is measured in Scoville units, with the Carolina Reaper maintaining the record for hottest chili EVAR. 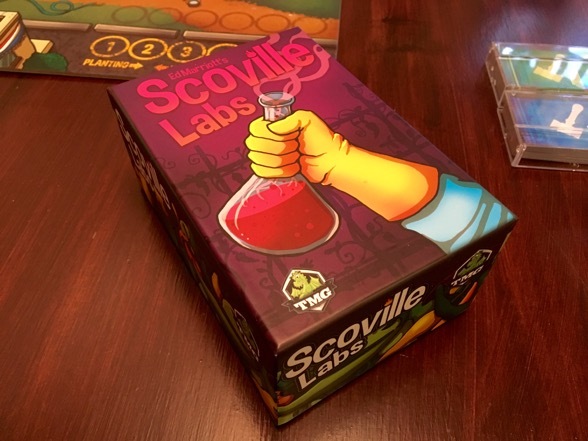 Scoville units are also the inspiration behind the adorably cutthroat game Scoville and its expansion, Scoville Labs, both by Ed Marriott. In the base game, players plant peppers, harvest crossbreeds, and use their bounties to earn accolades at the local chili contest, among other things. It’s a delightful game, but at high player counts, the competition for limited resources can get downright vicious, causing frustration for some as their Scotch Bonnet dreams go down in flames.